Receive free prepaid gratuities on select 2019 departures. Click here for eligible departures. Welcome to Vietnam! Hotel rooms are available for mid-afternoon check-in. CLASSIC After lunch, a Visit to the Tuol Sleng Genocide Museum and one of the Killing Fields provides a glimpse into the atrocities inflicted on the Cambodian people by the Khmer Rouge regime. DISCOVERY Board a sampan this morning and Visit a Local Workshop in Ben Tre to see how rice paper, rice wine, and traditional candies are made. Continue on to a local garden, where several types of fruit indigenous to the area are grown. The best way to experience Vietnamese culture is with a tour of its fascinating capital of Hanoi. Go on a cyclo ride through the ancient streets of the Old Quarter and enjoy a water puppet performance. Travel through the peaceful countryside to Ha Long Bay, where you’ll cruise by its breathtaking limestone islands. Next, in Siem Reap, Cambodia, see the phenomenal Temples of Angkor with an intricacy and architectural grandeur unmatched in the world. Enjoy an inspiring Aspara dance performance before embarking on your river cruise. Go on an ox cart ride amongst rice paddy fields and witness the daily lives of farmers. In the capital of Cambodia, Phnom Penh, tour the National Museum and Royal Palace with its striking Silver Pagoda. On a hilltop at the site of the 8th-century temple of Wat Hanchey, take in the stunning views before walking through the rural village of Angkor Ban to visit with welcoming schoolchildren. Continue your cruise into Vietnam and visit a colorful market, the home of a local family making handcrafted sampans, and a workshop to learn how rice wine and traditional candies are made. This memorable Southeast Asia river cruise vacation ends in Ho Chi Minh City, where you’ll see the famous landmarks and try your hand in the kitchen—Vietnamese-style, with a cooking class. On an excursion to the Cu Chi Tunnels, walk through a section of the immense underground tunnel system used during the Vietnam War. Participation in this vacation requires purchase of the following flights from Avalon Waterways, not included in pricing: (1) roundtrip air from your U.S. gateway and intra-vacation air segments; or (2) intra-vacation air segments only, starting at $364. 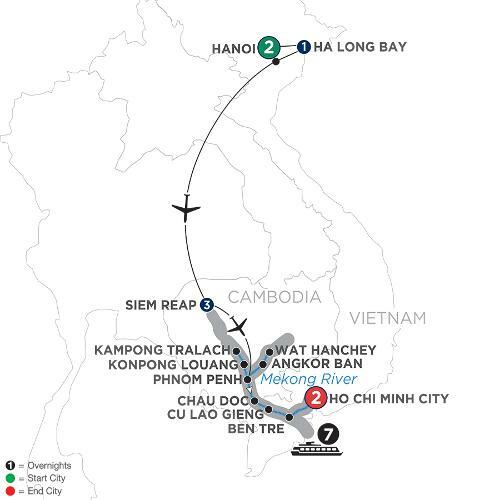 Required intra-vacation air segments: Siem Reap/Phnom Penh; Hanoi/Siem Reap. Air prices were effective on February 7, 2018 and their availability is limited. At the time you purchase your tour, air prices may be higher.